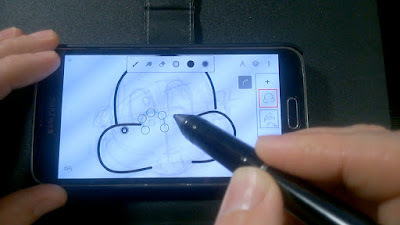 As mobile phones become more powerful with bigger screens it just makes sense to utilize these devices as a sketchbook. Chances are, your mobile phone is nearly always within arms reach anyway so, instead of carrying a sketchbook everywhere, why not just use your phone? My current phone is a Samsung Galaxy S5, running Android 6. It's fairly powerful and has a relatively large screen. Prior to that I had a Nokia, Lumia 720 phone running Windows 8.1. It has a smaller screen but I used it a lot for sketching ideas and characters. Generally most modern phones with a capacitive touch screen (the kind that you can use your fingers with) should be fine for sketching. However, most phones don't come with a stylus. If your's does and you find it works well for drawing you can skip to the next section. simple artwork from start to finish. I've tried numerous styli with my phone to find one that works right for me. Here's a run down of what I have and my thoughts on each. 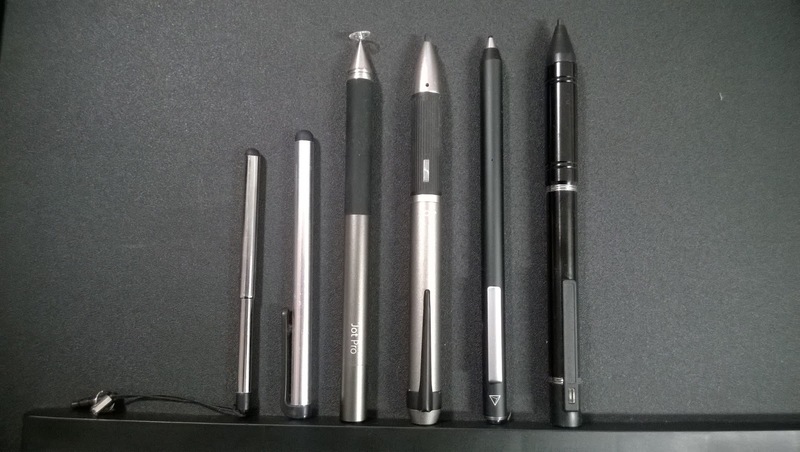 All of these styli are designed to work with any capacitive touch screen and do not have advanced features like pressure sensitivity or palm rejection (implementing these features require software drivers and will limit the stylus to specific devices and apps). 3. Joy PinPoint; 4. Adonit Dash; 5. Generic Fine Point Stylus. Common Rubber tipped stylus (Cheapest option, find them at bargain stores for a few dollars). If you have nothing else you could get used to these but they are very much like drawing with a crayon. It's hard to see around the bulbous head when you're trying to draw detail. Adonit Jot, Pro (US$30.00 approx). This kind of stylus has a transparent plastic disk attached to a metal point, giving it maximum contact with your device and solving the problem of not being able to see where you're drawing on detailed images. I really like the Adonit Jot, Pro and used mine quite a bit. However it doesn't really capture the 'pencil' drawing experience. Joy, Pinpoint, Precision Stylus. (US$50.00 approx). Joy doesn't appear to sell these anymore but you can still pick up the 3rd generation ones through Amazon. These fine tipped styluses with the carbon fiber tips provide some resistance when drawing on a touch screen and are the closest to feeling like drawing with a regular pencil. The tip is able to be so fine because the stylus is boosted by the power of a single AAA battery stored in the shaft. This Stylus has my preferred stylus tip but I had issues with the one I bought, such as the battery going flat after a week whether I used it or not and the pen its self powering down 5 or so minutes into drawing even if I was still drawing. Adonit, Dash (US$50.00 approx). These are fantastic for drawing with. A single USB charge lasts for up to 12 hours of use and only takes 30 minutes to recharge. The fine tip is great. The only draw back is the hardness of the tip makes it feel more like drawing with a ball point pen rather than a pencil. Otherwise, I highly recommend this stylus. 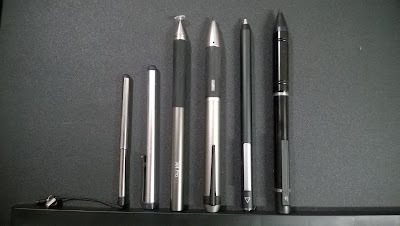 Generic, Fine Point Chinese Import Stylus (US$15-$20.00) - These operate much like the Joy Stylus but are USB powered. Surprisingly good build quality with extra rubber replacement tips included. I really like the 'pencil' like feel of these styluses and, at the price, I just can't pass them up. They work really well. The last thing you'll need is a drawing/sketching app. I've tried a whole bunch of them. Note that I've only used Windows and Android based Apps. However if you're using an iOS device you should have no trouble finding great art apps (it's what iOS and Apple are known for). 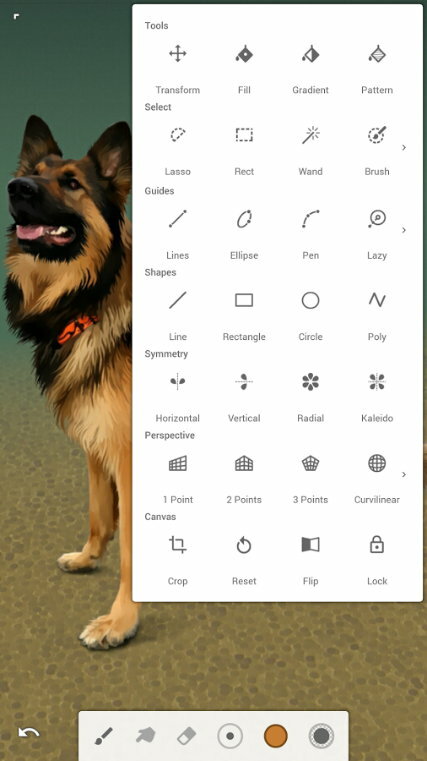 On my Windows phone I settled on an app called Sketch It. A fairly basic raster/bitmap based drawing application. No layer support, it's most impressive drawing feature was being able to adjust the opacity of the brush you draw with. This meant that I could keep my brush color black but begin sketching at 20% opacity for really light construction lines. Increase the opacity to 40% on the next pass and then 60% etc. I really liked it. On my Samsung, Android phone I wanted something more fully featured that I could potentially create finished art with if I wanted to. There are several good Raster/Bitmap options including ArtBoard and ArtFlow but I finally settled on Infinite Painter. with easy to find and use tools. Infinite Painter can handle relatively large sized artworks at a resolution high enough for printing but it's also great for smaller sketches and artwork to fill up your Instagram, Facebook or Tumblr feeds. 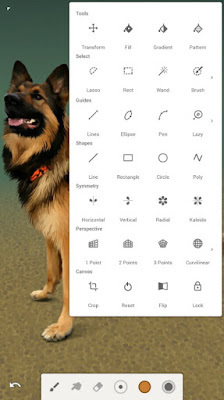 It has features you'd expect of a desktop drawing application organized into easy to navigate menus with tools that are easy to use with a stylus. 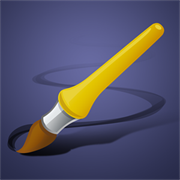 Infinite Painter also has a partner app called Infinite Design for creating vector art. It's shares a similar user interface and is great if you are interested in turning your Painter sketches into vector finished art. Not essential but if you're into, or want to try, I bit of hand drawn animation there are a number of great apps for this too. I love breaking out an app called PicsArt Animator and doodling animated sequences like you might with an old school, post-it note flip book. There you have it. 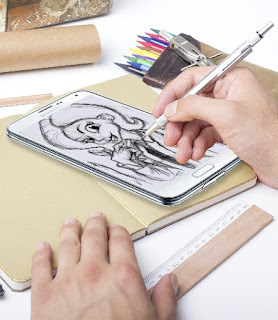 Everything you need to start using your phone as a sketch book. I particularly like sketching/doodling on my phone when I'm watching something on TV that doesn't require my full attention. It's more productive than constantly scanning social media or watching for emails. Without a doubt, I've always find that the use of Styllus, be it from mobile phones or tablets, it's a great way to create a more unique 3D video animation as it gives the user more control of the character that they are coming out with.